Republished March 10, 2014, to correct an error in the table. Coal-fired power plants in the United States have been under significant economic pressure in recent years because of low natural gas prices and slow electricity demand growth. The Annual Energy Outlook 2014 (AEO2014) Reference Case projects that a total of 60 gigawatts (GW) of capacity will retire by 2020, which includes the retirements that have already been reported to the U.S. Energy Information Administration. Coal-fired power plants are subject to the Mercury and Air Toxics Standards (MATS), which require significant reductions in emissions of mercury, acid gases, and toxic metals. The standards are scheduled to take effect in April 2015, a deadline that is conditionally allowed to be extended by up to one year by state environmental permitting agencies. 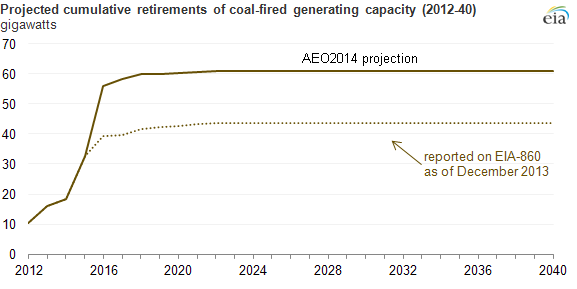 Projected retirements of coal-fired generating capacity in the AEO2014 include retirements above and beyond those reported to EIA as planned by power plant owners and operators. In these projections, 90% of the coal-fired capacity retirements occur by 2016, coinciding with the first year of enforcement for the Mercury and Air Toxics Standards. To comply with MATS, it is assumed that all coal-fired plants have flue gas desulfurization equipment (scrubbers) or dry sorbent injection systems installed by 2016. Retirement decisions are based on the relative economics and regulatory environment of the electricity markets. A plant may retire if higher coal prices, lower wholesale electricity prices (often tied to natural gas prices), or reduced utilization make investment in equipment like scrubbers uneconomical. The Reference case projections shown in the graph above reflect EIA's baseline for comparing a number of different sensitivity cases exploring variations on these factors. The full Annual Energy Outlook 2014 including all sensitivity cases will be released in the spring. At the end of 2012 there were 1,308 coal-fired generating units in the United States, totaling 310 GW of capacity. In 2012 alone, 10.2 GW of coal-fired capacity was retired, representing 3.2% of the 2011 total. The table below shows the progression of coal-fired generating unit retirements between 2010 and 2012. Units that retired in 2010, 2011, or 2012 were small, with an average size of 97 megawatts (MW), and inefficient, with an average tested heat rate of about 10,695 British thermal units per kilowatthour (Btu/kWh). In contrast, units scheduled for retirement over the next 10 years are larger and more efficient: at 145 MW, the average size is 50% larger than recent retirements, with an average tested heat rate of 10,398 Btu/kWh. Note: Data for 2009 through 2012 represent actual retirements.